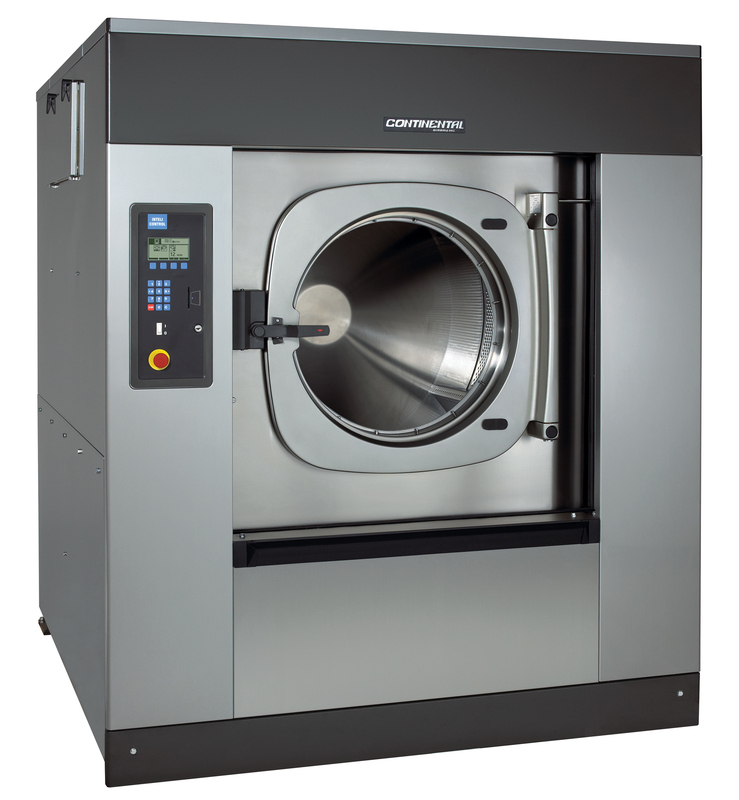 Oshkosh, Wis.— Continental Girbau Inc. (Continental) recently added a 190-pound capacity E-Series® Washer-Extractor (EH190) to its soft-mount washer lineup. Engineered to drastically improve laundry production, linen life and utility efficiency, the EH190 features a robust 30-cubic-foot basket capacity, highly flexible Inteli control, and up to 12 internal and external chemical dosing signals. Delivering high performance and backed by an industry-leading 5/3-year warranty, the EH190 outputs extract speeds up to 386 G-force and is available in stationary and tilt models. Like all E-Series washers, the EH190 features a Multi Directional Springs system that absorbs vibrations and noise. This eliminates the need for ground anchoring. While hard-mount washers require approximately 18 inches of clearance between installed machines, E-Series soft-mount washers only require a half inch. Thus, E-Series Washers bring simpler installation and tighter clearances for gains in production per linear foot over hard-mount machines. Similarly, E-Series Washers, and the EH190 specifically, reach higher extract speeds when compared to most hard-mount washers on the market. The EH190 offers high-speed extract reaching up to 386 G-force. By comparison, most hard-mount washers only reach 70-200 G-force extract speeds. As a result, E-Series Washers remove considerably more water from each load, which reduces the time it takes to dry a load of laundry by as much as 50 percent, according to Jorgensen. “Because laundry takes less time to dry, drying tumblers and linens experience less wear and tear. This improves the longevity of linens and towels, as well as dryers,” he said. Thanks to the high-speed extract of E-Series Washers, facilities can bolster laundry productivity using less labor and utilities. The new EH190 boasts superior programmability thanks to the Inteli Control, which offers 20 pre-programmed and 79 modifiable cycles. Via the Inteli, operators gain complete control over every variable of the wash process, including water temperature by degree, five levels of mechanical action, water levels, chemical injection, bath cool-down by degree and extract speed. Making programming simple and quick, the Inteli Management Tool (IMTx) allows users to design wash programs and configurations on their computers or tablets, save and organize them by account or category. Multiple programs can be viewed simultaneously using IMTx so it is easy to compare, copy and modify each of the parameters within separate programs. The programs can be saved to an Inteli memory card and shared via email – making it quick and easy to copy programs onto other machines. Finally, the Inteli’s SmartLoad system automatically adjusts water consumption and dosing time to coincide with a load’s weight, fabric type and program selected – lowering water usage and labor time. Engineered for unsurpassed efficiency, E-Series Washers use approximately .82 gallons of water per laundry pound, depending on the model. A water recycling system reuses prewash and wash water – slashing consumption by up to 50 percent over machines without similar systems. Further decreasing water waste are the AquaFall and AquaMixer systems. AquaFall releases water into the load via holes in the drum lifters. As the drum turns, lifters release water from above to better penetrate fabric. With E-Series, laundry is saturated from above and below. This cuts water usage and rinse cycle times while improving wash quality. AquaMixer further improves efficiency by mixing hot and cold water before entering the drum – creating precise water temperatures for greater control over hot water consumption. To discover more about Continental laundry products – backed by leading factory warranties – visit www.cgilaundry.com or call 800-256-1073.